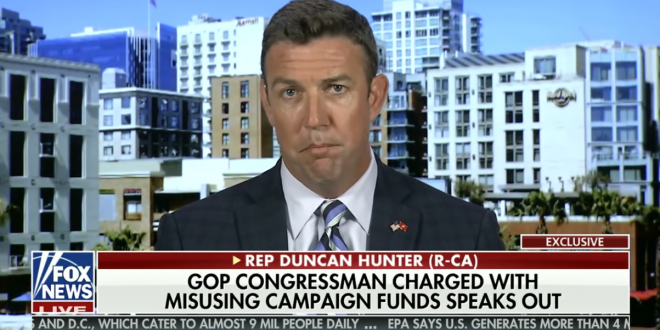 GOP Rep. Duncan Hunter +8 Despite Theft Arrest - Joe.My.God. Rep. Duncan Hunter (R-Calif.) holds an 8-point lead over his Democratic opponent despite being indicted on charges of misusing campaign funds, according to a new poll. A Survey USA poll published Monday found that among likely voters in California’s 50th District who were surveyed, 47 percent plan to vote for Hunter, compared to 39 percent who favor Democratic challenger Ammar Campa-Najjar, if they are the only two candidates on the ballot. President Trump won the district by 15 points in 2016. Among Republicans, 77 percent of likely voters said that despite his indictment, they would vote for Hunter if the election was held today, the poll found.